Since October 2017, I have had the opportunity through the support of a company called Education Group Central to teach middle school students in China English as a second language online. The experience was enriching as I would often pick up the guitar and teach the students a new American song. I never thought I would have the opportunity to visit and see them face to face. On March 10, I was invited to travel on my first visit to China in order to meet all my students whom I had been teaching on the screen. The experience was surreal. I’m sure it was the same for them. As we all met each other for the first time, we were star-struck; it was like we met someone we had only been watching in the movies. 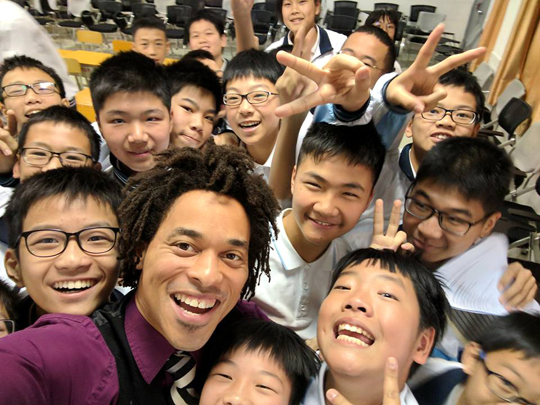 Jeremy Holloway took a selfie with some of his students. My classrooms were in multiple cities all over China, so I visited them all. The first stop was in Beijing, then by plane to Zhongshan. From there, I traveled by train to Guiyang, then to Xi’an, and then back to Beijing. I had the opportunity to visit the Great Wall of China and the Forbidden Palace in Beijing. I also had the opportunity to see the Terracotta Army Sculpture Museum in Xi’an. I tried everything from hot pot and Chinese burgers to Peking duck. It was phenomenal. Since some of the distances between cities was farther than a trip from New York to Orlando, Fla., I had the opportunity to experience all kinds of climates from areas with the same temperature as Toledo to areas with T-shirt weather and palm trees. I visited the schools and taught each class one lesson, and then we had time for questions and answers. Most of the students asked me about my experience in China, what cities I visited, and how I liked the food. I felt like a celebrity as they crowded around me to ask for my autograph. A very humbling experience indeed, but we all enjoyed ourselves. Jeremy Holloway took a selfie with the Yale Alley Cats on the Great Wall of China. What made my experience very unique on top of visiting the students — I was placed on a tour with a group called the Yale Alley Cats. The team of undergraduate male Yale students is part of a group that started at the school in 1943. It was fascinating to spend time with these students and ask them questions about their experience applying and getting into Yale. Some of the students shared how they took the SAT and the ACT 19 times before entering, and another student said he only took the test a couple of times, but wrote a good essay. The students were extremely talented in different ways, from knowing two or three languages to their well-mannered behavior everywhere they went. But the one thing I learned from them that was fascinating was their common decisions in choosing Yale because the university let them pursue the arts along with STEMM (science, technology, engineering, math and medicine). They shared how they felt other Ivy League schools only cared about the academics, but Yale strongly encouraged a balance of pursuing the arts like singing, dance, languages, etc., along with their academic interests. What I realized the most was the students were passionate about something they studied, and they credited that passion to why they really got accepted to Yale. After I shared with them my joy of singing, they also graciously let me lead one of their songs during a dinner together. I sang “If I Ain’t Got You” by Alicia Keys with the Yale Alley Cats. 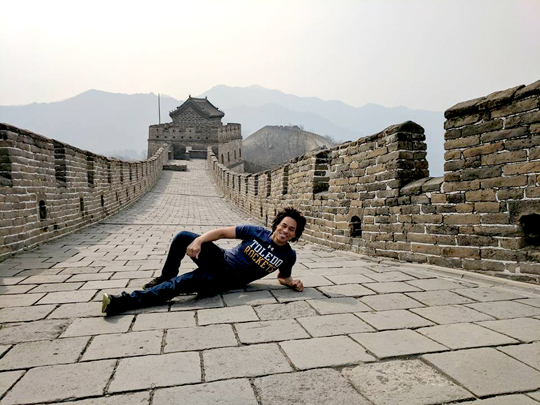 Sporting one of his favorite UT T-shirts, Jeremy Holloway had his photo taken on the Great Wall of China. I was proud to represent The University of Toledo with these students. I shared with one Yale student how my father worked at The University of Toledo just so I could have the opportunity to go to school, and I feel like I am living out a legacy. My story was well-received, and it felt good to form a mutual relationship with these students through my story. Something the Yale students attribute to their success in academics is something that I believe successful UT students can also attest to. It was refreshing to hear that their success in their academics at Yale, in their opinion, is still dependent on their involvement in student activities and groups on campus. None of the students thought it a good idea to lock themselves in a room and study all day. In fact, they shared how they met their best friends in this Yale singing group and that when they feel stressed from the heavy work they have to do, the time with their Alley Cat friends melts away their stress and gives them the balance and the fortitude they need to excel in their academics. Most importantly, I find it crucial to understand that the name of a university is only relative to the goals you want to accomplish. I want University of Toledo students to understand how our pride in our university makes us stand side by side with the best of them. I would encourage each UT student to become crystal clear about his or her goals and treat The University of Toledo as a Harvard student treats Harvard because they understand that the university never made the people, but the people always make the university. Go Rockets! Holloway is a doctoral student in the Judith Herb College of Education. Last year, he was honored with the 20 Under 40 Leadership Award, which recognizes Toledo community members 39 or younger who demonstrate exceptional leadership qualities. The UT alumnus received a bachelor of arts degree in Spanish and a bachelor of education degree in 2005, and a master’s degree in English as a second language in 2014. This entry was posted on Friday, March 30th, 2018 at 3:53 am and is filed under Alumni, Op-Ed, — Judith Herb College of Education .